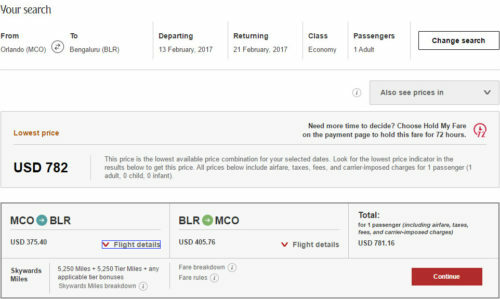 ITA will pull up fares of $786 while Emirates will price the same fares at $781. Valid for travel from mid-January, 2017 – late-May, 2017 for Sunday through Thursday departures and for Monday through Thursday returns. Must purchase at least 7 days in advance of departure. Emirates is an Alaska Air partner. Mileage earning when crediting to Alaska Air is below.